Bethanne Chance recently went on vacation with her family and for the first time in years they had trouble keeping up with her. Over 70 pounds lighter than she was a year ago, Beth Ann said she often finds herself power-walking. “It was great to go on vacation and have that much energy,” said the West Frankfort woman. She said she owes her weight-loss on a program offered through SI Medical Weight Loss Clinic in Marion. 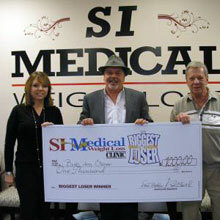 Beth Ann won a $1,000 prize offered during “The Biggest Loser Challenge” at the clinic. She lost 73 pounds between June and December of last year and she plans to keep it off. Clients are offered a variety of tools to make lifestyle changes. After meeting with the Nurse Practioner and deciding upon the best program for them, which may include, Prescription drugs, including appetite suppressants, and/orB12 injections, all clients meet with Brian Carroll, a licensed and registered dietician for dietary counseling and recommendations to increase their activity levels. Bethanne started the program in June, 2011. She found weekly B12 injections to be very beneficial and followed the dietary counseling of Brian. She continues the B12 injections, which she still finds valuable. “My last visit to the doctor my thyroids levels were better than they have been in years,” said Bethanne. Tracy wants people to know that help is available to everyone. From those wanting to lose just a few pounds to those who have fought obesity throughout their life. Every program is geared specifically to each individual. While medications are utilized to help dieter’s get to their goal weight, the strategy is that with regular follow-up visits and counseling with the Dietician, changes in their daily diets and activities become lifetime habits – and the weight will stay off this time! The idea for the clinic grew out of a personal need. When I went to find a weight loss program that I felt would work for me, there wasn’t one. I didn’t want pre-made meals. I visited a couple of clinics that provided one medication, however their “nutritionist” was focused on meal replacements, bars and so forth – that wasn’t for me either. However I did think that they had something there. I thought to myself, this is good – but it could be done so much better. When I shared with Don (Baker) and Paul (Smith) what I had experienced they became convinced that we needed to do this in Southern Illinois. We were so fortunate to find the right medical professionals – Lito Tacedaras, APN, Sharon Ball, APN and Brian Carroll, MS, RD, LDN With DR. Donald Griffin as Medical Director, were all key in developing the program It is so exciting to see client’s expressions when they come in and have lost – we just put in a big brass bell so that they can ring it when they come out of the weigh-in room. Everyone has an off week here and there – we focus on next week. Many clients are finding that most services are covered by their individual health insurance plans, and are able to receive reimbursement. While walk-ins are welcome, appointments are recommended. For more information and to read testimonials, visit their website at www.siweightloss.net or give them a call at 618-997-5677. The clinic is located at 1909 Coolidge Avenue, directly behind Tequila’s Mexican Restaurant in Marion. Like and share our new Effingham facebook page! SI MEDICAL WEIGHT LOSS INC. Copyrights by SI Medical Weight Loss - 2016. All Rights Reserved.